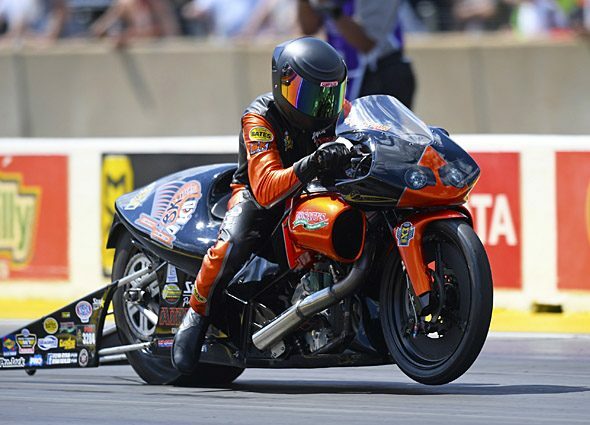 Two-time American Motorcycle Racing Association (AMRA) Pro Modified champion Flyin’ Ryan Oehler tested the NHRA Pro Stock Motorcycle (PSM) waters last year and found the temperature just right for a full assault on this season’s Road to the Future award—the National Hot Rod Association’s version of Rookie of the Year. 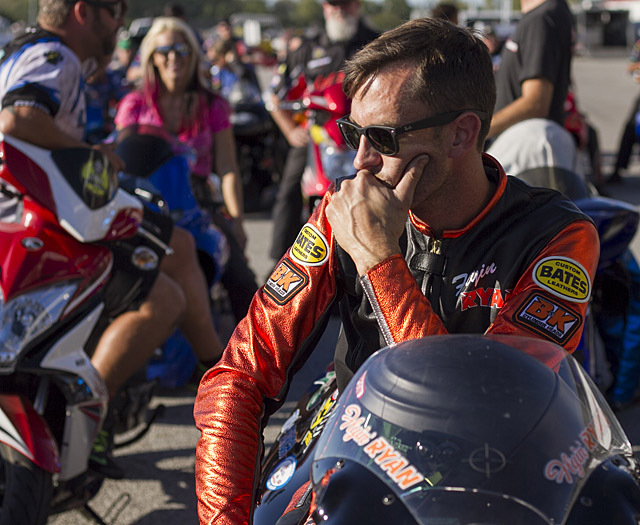 Oehler entered George Bryce’s racing school in 2013 and was a finalist in the Star Racing Challenge in 2015, which is where he got his first taste of riding a Pro Stock Motorcycle. Oehler and his father Brad run a busy HVAC business, so test days for them are frequently redeye flights in the A.M. followed by late night return flights and back on the job first thing in the morning. But the Oehlers’ hard work is paying off. “We’re getting comfortable with the bike,” Ryan said, referring to the S&S-powered Buell he acquired from Star Racing—the one Angelle Sampey rode in 2015. Oehler qualified at his home track in St. Louis last year and again in Pomona, and missed the show by one spot at his other two events. While at D&G and testing in nearby Bradenton, Oehler also received help from Jay Regan of MRE and the Manufacturers’ Cup. “Jay’s been right there with me every step of the way. He’s been very helpful, introduced me to a lot of important people, and been kind enough to work with me on parts and storage of the rig. He is one of my best allies. The elder Oehler started working on Pro Stock Cars in the ‘70s before switching over to Harley-Davidson race and street performance, and both father and son are particularly excited about this particular Gatornationals —the first time that Pro Stock Motorcycles and Top Fuel Harleys are racing at the same NHRA national event. “We come from the all-Harley world, so this is a big deal for us. We set the Top Fuel Harley record in the ‘90s with Bill Furr,” said Ryan, who’d like to see one sponsor bridge the gap between the close precision of Pro Stock and the rough and tumble violence of nitro. 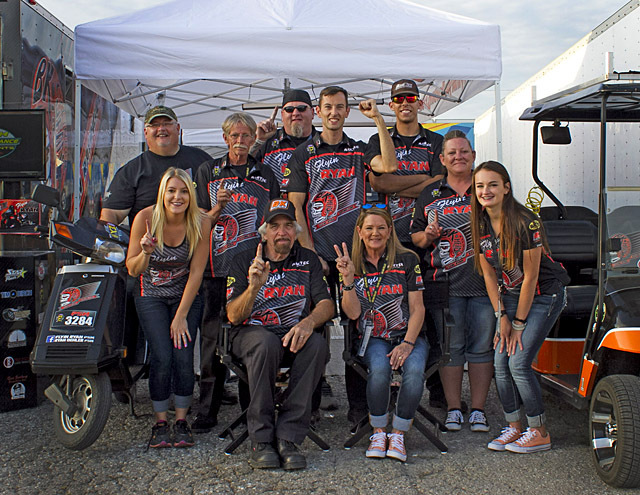 “We want to team up with a Top Fuel program and give a sponsor 24 race exposure. S&S https://www.sscycle.com , MRE http://www.murdochracing.com , D&G Chassis http://www.dgchassis.net , Rosati’s Pizza https://www.rosatispizza.com , Bates Leathers https://www.batesleathers.com/ , Worldwide Bearings http://www.worldwidebearings.com/ , AirTec, Inc. https://www.facebook.com/airtecinc/ , B&K Cylinder Heads and Flyin’ Ryan Racing FlyinRyanRacing.com , and his family.